Federer worked hard to book his first final at this venue since 2009. In the third round versus Julien Benneteau, the Swiss was two sets to love down and two points in a fourth set tiebreaker from exiting the tournament. In the fourth round, Federer faced another inspired thirty something, Xavier Malisse, and had to overcome a back problem. Federer’s sternest challenge was the semifinals against Novak Djokovic. The Serb has had the Swiss’ number of late, with six out of seven wins including two heartbreakers in the semifinals at the U.S. Open. Federer found his best form against Djokovic to clinch his spot in the final. It was Murray who embraced the occasion early on, breaking Federer in the opening game then consolidating for a 2-0 lead. 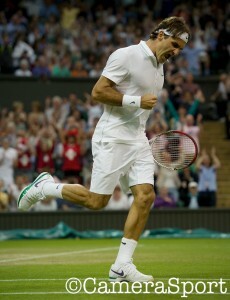 Subsequent to posting his first game, with a backhand down the line winner, Federer fabricated his initial break point. When Murray’s next stroke traveled long, the set was leveled at 2 all. Later in a long game with five deuces, Murray survived two break points to get 4 a piece. Soon, Federer committed a crucial forehand flub to hand Murray double break point. When Federer buried his second straight forehand into the net, Murray had the break and a 5-4 advantage. Murray comfortably closed out the initial set. In their head to head, Murray led Federer 8-7. In Murray’s three prior finals at majors, including two versus Federer, he had been unable to claim even one set. Consequently, this was a significant step forward for the Brit. In the second set, Federer’s forehand came to life. Moreover, his serve became more accurate and his volleys more precise. In the fifth game facing double break point, Federer connected on a couple of superb volleys to remain on serve at 3-2. At 4 all, Federer staved off a break point to stay ahead. With Murray serving at 5-6, Federer provoked his rival into a miscue to get to set point. With a sublime backhand volley winner, Federer squared the match at one set a piece. With Federer serving at 1-1 and 40-0, in the third set, an intense downpour resulted in the roof being closed. After a 40 minute interruption, Federer tucked away the game for 2-1. The set’s sixth game proved the pivotal juncture in the match. With Murray leading 40-0, Federer fought his way to deuce. Ten deuces and almost twenty minutes later, Federer struck a forehand lob for his sixth break point. When Murray’s forehand down the line found the net, Federer move in front 4-2. 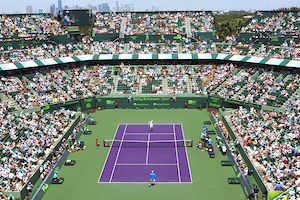 Subsequent to consolidating for 5-2, his next service game, Federer thumped an ace to take a two set to one advantage. Murray battled well, forcing Federer to deal with a break point before squaring the fourth set at 1 all. The dagger was plunged when Federer’s weaker wing, the backhand, connected on a crosscourt pass for a winner giving the Swiss the break and a 3-2 edge. Murray got 30-30 on Federer’s following two service games. But, Federer’s sensational volleys did not miss and ultimately he was at 5-3. Despite a difficult game, Murray held and made Federer serve for the trophy. Courtesy of an ace, Federer secured double match point. When a crosscourt forehand pass by Murray sailed wide, Federer dropped to the ground relieved to have claimed his seventeenth major. For all watching, there was sympathy for Murray who was attempting to hold back his tears. For a nation yearning for a hometown champion, Murray wanted all to know “I‘m getting closer” as he flashed a wry smile resulting in boisterous applause. Attempting to say a few words, Murray cited “I’m going to try this but it’s not going to be easy” as the tears began to flow. After regaining a bit of composure, Murray stated “I was asked the other day after I won my semifinal match, is this your best chance? Roger is 30 now. He’s not bad for a 30 year old. He played a great tournament. I know he had some struggles early on with his back. It shows how much fight he still has left in him. Congratulations, you deserve it”. After thanking everyone in his box, Murray had a warm message for the fans “everybody talks about the pressure of playing at Wimbledon, the people watching make it easier to play. The support has been incredible, thank you”. Federer consoled Murray with a hug as his twin daughters looked on. The Swiss himself has been disappointed on several occasions. Federer praised Murray saying “he has done so well over the years, has been so consistent. It shows that he cares so deeply about tennis, this tournament. He will at least win one grand slam. This is what I hope for Andy”. Federer conceded that Murray was in control early on and expressed “it’s worked out so many times over the years here, at Wimbledon, that I’ve played my best in the semis and the final. Obviously, I could not be [happier]. It feels great being back here as the winner. I’ve missed playing in the finals, it’s a great moment”. After three years to once again hold the trophy, Federer admitted “it feels nice. It feels like it never left. I’ve gone through some struggles, a lot of change in my life. This one comes at the right time”. In terms of equaling Sampras with seven titles, Federer said “it’s amazing. Sampras is my hero”. On Monday, Federer reclaims the number one ranking and will tie Sampras for the most weeks at that spot. Federer declared despite the various opportunities lost at the last few majors “I never stopped believing”. Federer went on “I played more even though I had a family. It all worked out. I had great momentum, great confidence and it all came together. It’s a magical moment for me”. Federer last hoisted the trophy at a major at the 2010 Australian Open. The drought ends exactly four weeks prior to the Swiss’ 31st birthday on August 8th. Considering Federer’s fitness and resilience, major number 18 may not be far behind.